A group of Arizona teachers spontaneously organized the #RedForEd grassroots effort — which has spurred talks on social media of a possible strike — over the weekend. Thousands of the state’s classroom teachers participated. As of Wednesday afternoon, more than 20,000 people had joined Arizona Educators United, a closed Facebook page teachers created Sunday for the demonstration. On social media, teachers, parents, supporters, school board members and administrators wrote notes of encouragement and shared pictures of themselves draped in red and touting the hashtags #RedForEd and #AZWhatIsThePlan. “I hope that everybody realizes that teachers have legitimate power right now, and we haven’t fully used it yet but we can,” said Noah Karvelis, one of the protest’s organizers and a music teacher at Tres Rios Service Academy in Tolleson. Amy Ball, a kindergarten teacher in the Madison Elementary School District, participated in Wednesday’s demonstration. She said teachers are frustrated that pay and working conditions have not significantly improved. While the effort appears to have galvanized thousands of teachers, the head of the state’s teachers’ union said he was unsure what will happen next. 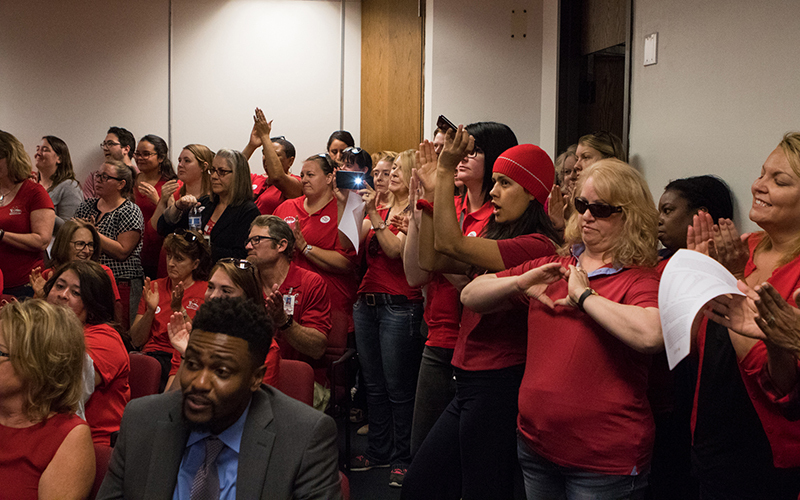 Joe Thomas, president of the Arizona Education Association, said he has “not seen this many teachers this frustrated since I’ve been in Arizona.” He called on state leaders to significantly address the issue this legislative session. Republican Gov. Doug Ducey and the Republican-led Legislature are currently in the midst of budget negotiations. Thomas said teachers have “no confidence” that state leadership will take action, but he stopped short of encouraging a statewide teacher strike. “A statewide action can take a lot of different forms. I think that with West Virginia, we paid attention once that happened,” he said. “But if you talk to any teacher in West Virginia, it’s months of discussions that lead to that frustration. Before and during school Wednesday, teachers, students and parents posted group photos and selfies of themselves wearing red and touting the hashtags #RedForEd and #AZWhatisThePlan. Save Our Schools Arizona, which is challenging a school-voucher law, created red shirts and sold them for $3, according to its website. Chairwoman Beth Lewis posted that the organization handed them out at the Capitol this week and even delivered some to teachers late Tuesday night. Karvelis, an organizer of Arizona Educators United, said teachers in Arizona were galvanized by their colleagues in West Virginia. Teachers there organized a nine-day strike across all 55 West Virginia school districts that was settled Tuesday after the state’s Legislature committed to boosting their pay by 5 percent. Arizona and West Virginia are among the states that pay their teachers the least. The median pay for Arizona elementary teachers was $42,474 in 2016, ranking 50th nationally according to the Arizona State University Morrison Institute for Public Policy. Arizona’s education system has yet to fully recover from the cost-cutting measures imposed following the recession. Experts and educators have said low pay, stressful working conditions and perceived lack of respect for the teaching profession are the main causes of the state’s current teacher landscape in which thousands of classroom positions either remain unfilled or staffed by people who are underqualified. Organizers of Wednesday’s teacher protest described the effort as the “first step” in mobilizing teachers for further action, though did not explicitly say they planned to strike. But that was the focus of discussion by hundreds of educators on the Arizona Educators United Facebook page and other social media. Comments indicated broad support for a strike, mixed with concern over what such action would mean for participants’ jobs and teaching certificates. In Arizona, teachers who participate in a statewide strike are at risk of losing their teaching credentials and jobs. 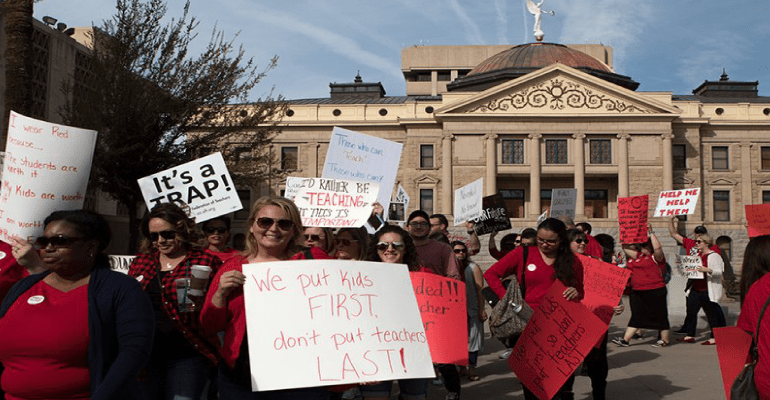 If a statewide teacher strike were to occur in Arizona, it would likely require greater mobilization efforts than West Virginia. West Virginia consists of about 20,000 teachers in 55 school districts. Arizona is estimated to have about 60,000 active classroom teachers in more than 200 school districts and a public charter sector of 550 schools. Resha Gentry-Ballance, president of the Classroom Teachers Association for the Phoenix Union High School District, said some teaches are pushing for more action. “We’ve been letting our state legislators know how frustrated we are and I think my colleagues are concerned that doesn’t seem to be getting us anywhere,” Gentry-Ballance said. She said a movement like a strike would need to come from the organic grassroots movement. Some people criticized the protest online for its perceived partisan tone that took aim against the state’s Republican leadership. Others questioned the merits of educators’ grievances, saying their jobs give them time off during the summer and the profession overall is not one known for its high-paying jobs. Neither Ducey or Arizona Senate or Republican leadership commented publicly about the #RedForEd protest Wednesday. Sarah Richardson, a Chandler parent of three who is involved in Save Our Schools Arizona, said she was “absolutely blown away” by teachers’ and supporters’ response to Wednesday’s demonstration. Richardson said she hoped a strike is not “the end result of this movement,” but would support teachers if they did. “We’ve tried many things that haven’t worked,” Richardson said. “So at this point, if it comes to a strike, I stand behind our teachers 100 percent and I will absolutely support that decision. Republic reporters Lily Altavena and Kaila White contributed to this article. Posted in Advocacy, Educators Protest, Funding For Education, Pension & Salary and tagged "Standing Strong for Public Education", #iBelieve, Accountability, Advocacy, Diversity, Education, Equity, Failing Schools, Public Education, School Choice. Bookmark the permalink.